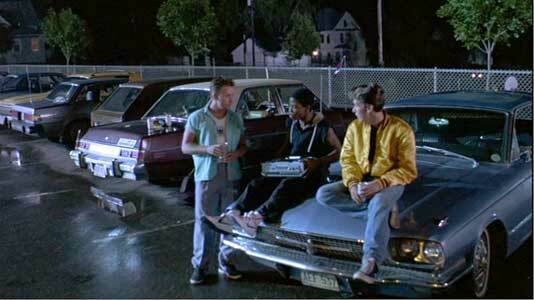 Craig Sheffer and Frank Howard wear black and light blue high top Converse “Chuck Taylor” All Stars in the film. Mark, Terry, and a chucks-wearing buddy hang out in the ’hood. That Was Then... 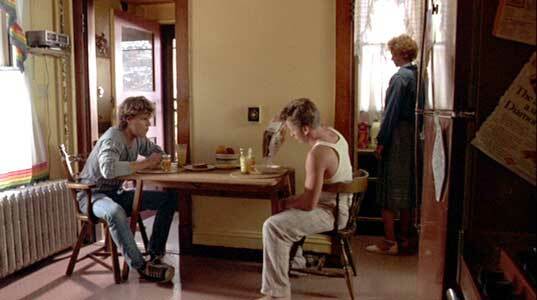 This Is Now is the story of two teenagers, Mark Jennings (Emilio Estevez) and Brian Douglas (Craig Sheffer) raised in the Los Angeles area as brothers, by Brian’s widowed mother (Barbara Babcock). Mark has become an orphan because his father killed his mother during an argument when she admitted that Mark wasn’t really his child. With his family life ruined, Brian and his mom are Mark’s only link to regular society. For years Mark and Brian have been best friends and borderline delinquents, hanging out in the local ’hood, with Mark usually being the instigator of petty crimes like “borrowing” a car for joyriding, and constantly fighting with rival teens to maintain a tough street presence. But things are changing in their relationship. Brian meets and starts dating Kathy Carlson (Kim Delaney), and as a result he is no longer interested in spending all of his time hanging out with Mark. Mark still wants to lead the delinquent life, and he is jealous of Brian’s interest in Kathy, making his displeasure known on a regular basis. Brian has also recently gotten a job at a local grocery store. Brian and Mark live with Brian’s widowed mother. Mark and Brian do have one mentor in their community, Charlie (Morgan Freeman) the owner of a local pool hall where they hang out occasionally and hustle pool games. But when Charlie is killed defending the boys from two disgruntled cowboys who they hustled at pool, their world even changes more, as Brian’s relationship with Kathy becomes more serious. And another complication occurs when Kathy’s younger brother, M & M (Frank Howard), disappears. Kathy asks Brian to help her search for him. Mark seems to have information, but is reluctant to divulge it. Eventually he shows Brian where M & M has been hanging out, but in the process their relationship is further strained, especially when Brian discovers that Mark has been dealing drugs to M & M, and he orders him to move out of his house. 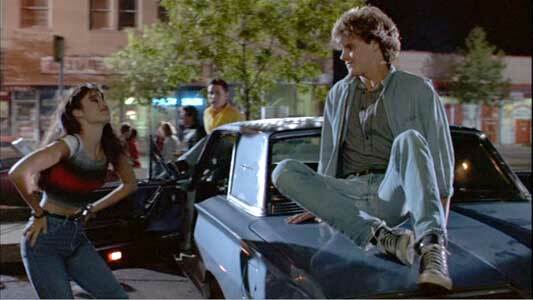 This causes Mark to flip out completely, and he is arrested by the police after driving recklessly through town. 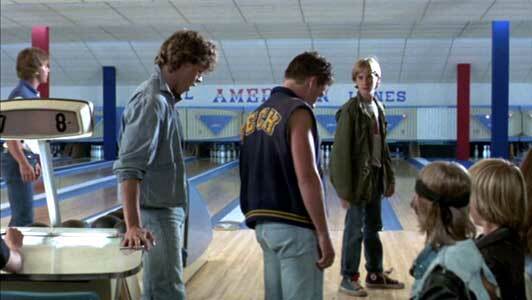 The end of the film deals with with how Mark and Brian finally reconcile their relationship. Kathy’s younger brother “M & M” is trying to find his own way, but has a lot of problems. Mark and Brian at home ready to “chuck it in” for the day. Many girls are attracted to Brian , but he is only serious about Kathy, who represents a stabler relationship than hanging out with Mark. 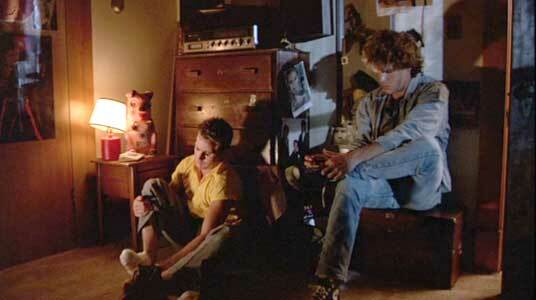 Brian wears black high top chucks throughout the film, and you see them in many shots, but the best scene is with Kathy, when they find M & M, who has run away from home. M & M is also seen wearing light blue high tops. Kathy and Brian find M & M strung out on drugs at an abandoned warehouse. That Was Then... This Is Now. (1985) Emilio Estevez, Craig Sheffer, Frank Howard, Kim Delaney, Barbara Babcock and Morgan Freeman. Directed by Christopher Cain. Categories: Drama, Crime.